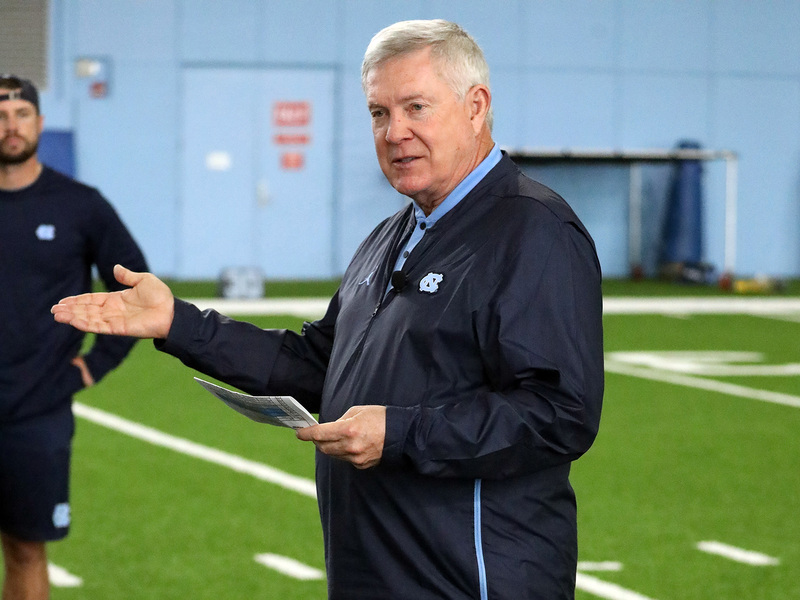 Mack Brown's return to Chapel Hill isn't the feel-good last hurrah you think it is. He knows how his Texas exit is viewed—and he wants to turn the Tar Heels into Oklahoma. CHAPEL HILL, N.C. — When they boarded the plane, Sally Brown cried. It was December 1997, and Sally had worked hard on her husband Mack’s Christmas present. The couple had designed North Carolina’s new football operations building from the ground up, but they’d only been able to use one floor of the building as Mack’s Tar Heels went 10–1 during the 1997 season. The whole thing would be open soon, and Sally wanted to add a special touch to Mack’s office. So she’d bought him a huge fish tank and had it installed before Mack was to move into the space. Every time he came to work, he’d get a taste of the tropics right there in Chapel Hill. There was only one problem. Texas had fired John Mackovic. The Longhorns needed a new coach, and Mack Brown was 20–3 in his past two seasons. So the Browns were heading to Austin. Mack’s fish tank would stay behind in the Research Triangle. “You just gave your Christmas present to the University of North Carolina,” Mack remembers Sally saying as they flew away. Mack Brown never saw that fish tank. It was long gone when he once again walked into the building as North Carolina’s head coach. Twenty-one years had passed, but the bones of what he and Sally built had held up well. The offices and meeting rooms needed some new graphics, but they otherwise would work just fine for a Power 5 football program in 2019. Down the way was a gleaming new indoor practice facility that predecessor Larry Fedora had used exactly once before he was fired for going 5–18 the past two seasons. Brown collides with familiar and new every day in the job he wasn’t sure he’d ever have again. Brown once knew Rick Steinbacher as a 21-year-old linebacker. He returned to find a forty-something associate athletic director. Tommy Thigpen was once a captain of Brown’s team. Now Thigpen coaches inside linebackers for Brown’s team. As Brown sits in a special teams meeting on a recent morning, he points out this collision. As special teams coordinator Scott Boone reviews punt team drills from the previous practice, Brown points out the young analysts who typed in the info the players see on the screen that tells them exactly what they did wrong or right on the play they’re about to see. Brown also points out executive advisor Sparky Woods, who was already South Carolina’s head coach before some of those analysts were born. The 67-year-old Brown is quick to note that this stint at North Carolina is not some getting-the-band-back-together last hurrah. Yes, he has employees (such as Thigpen and cornerbacks coach Dre’ Bly) who played for him as Tar Heels, but he also hired coordinators with no Carolina ties. Brown came here to win as much or more than he did the first time around, and he doesn’t think North Carolina needs much time to reach that point. The similarities between Brown’s situation at North Carolina and Les Miles’s situation at Kansas pretty much begin and end with the coaches’ ages. This isn’t a massive rebuild, something Brown knew because he served as an advisor to Fedora last year. Fedora’s final teams had some miserable injury luck to go along with poor chemistry, so Brown walked into more talent than most coaches taking over downtrodden programs do. In fact, Brown didn’t think the job would open. He figured UNC athletic director Bubba Cunningham would balk at paying Fedora’s $12 million buyout. Brown wasn’t shocked when, while riding back to his hotel from ESPN’s Bristol, Conn., studios following a broadcast last November, he looked at his phone and saw Cunningham calling. Brown assumed Cunningham just wanted to shoot the breeze. Instead, the AD told Brown that Fedora was out and that Brown could have the job if he wanted it. Brown wanted to coach again, but he had no idea if that chance would ever come. He remembers the days after he got pushed out at Texas following the 2013 season. For a few days, he enjoyed having time of his own after decades of rigid schedules. He had more money than he and Sally could ever spend. But men who reached the pinnacle of their profession typically aren’t wired to fade into peaceful retirement. “I have nothing to do for the rest of my life,” Brown remembers thinking. Brown took that job with ESPN in 2014. He used it to gather intelligence. Production meetings with coaches before games turned into brain-picking sessions that Brown would later transcribe into a file he kept ... just in case. One of those sessions took place at Army with Black Knights defensive coordinator Jay Bateman. “We talked for an hour about college football and defense,” Bateman says. “He was researching the whole time.” After an odd few days when Greg Robinson was going to be the Tar Heels’ defensive coordinator and then wasn’t, Brown hired Bateman to run UNC’s defense. When they weren’t in Bristol, Brown and Sally spent much of their time at their house in the North Carolina mountains. There, Brown’s golf buddies were some of North Carolina’s biggest boosters. So he stayed apprised of the goings-on in Chapel Hill. After Texas, some schools had come sniffing around. Brown won’t say which ones, but he will say that Sally vetoed almost everything. In the end, she allowed him only three potential coaching destinations. *Brown is aware that there is no college football program in The Bahamas. He would have had to start one. He would have called the team the Iguanas. So after Cunningham called Mack, Mack called Sally. After he hung up with her, he called Tim Brewster. Brewster broke into college coaching back in 1989 when, as an Indiana high school coach, he drove to Chapel Hill and told Brown he’d work for free. (Brown, after some consternation, decided he couldn’t beat the price.) Brewster worked with Brown (for money) for the next 12 years. He made the move to Austin but left after the 2001 season to coach in the NFL. Stints with the Chargers and Broncos helped Brewster get the Minnesota head coaching job, but that lasted less than four seasons before Brewster was fired. Since 2013, he had been Jimbo Fisher’s ace recruiter—first at Florida State and then at Texas A&M. The Aggies can pay enough to keep most assistants, but Brown had an even more valuable bargaining chip: Brewster’s forever house. When he worked at Florida State, Brewster built a house 11 miles from North Carolina’s campus as a hub for Brewster, his wife and their three grown sons and their families. “What happened at Texas” is a pretty broad phrase that includes nine consecutive double-digit win seasons, two Big 12 titles and a national title. But what Brewster refers to is the end, those four seasons following the run to the BCS title game in 2009 when Brown seemed to lose his fastball. The Longhorns couldn’t find a quality quarterback, yet other Lone Star State QBs (Andrew Luck, Todd Reesing, Case Keenum, Ryan Tannehill, Robert Griffin III, Johnny Manziel) became stars elsewhere. Brown tinkered with the offense, but everyone else seemed a step ahead. Brown went 30–21 in those last four seasons. That would wind up being better than the guy who replaced him (Charlie Strong), but it wasn’t good enough for the program former athletic director DeLoss Dodds once referred to as “the Joneses”—as in the people one attempts to keep up with. Brown has gone over all the failures of his last few years at Texas in his head. There was the decision to make defensive coordinator Will Muschamp the Longhorns’ head-coach-in-waiting, which accomplished the goal of getting the sought-after Muschamp a bigger paycheck but also sent a signal that Brown was ready to hang it up when he wasn’t. There were the offensive issues when Texas seemed stuck in slow motion as the rest of the Big 12 moved to light speed. The hire of Longo also helped Brown nail down his first big recruiting coup at the new job. Quarterback Sam Howell from Monroe, N.C., spent most of the recruiting cycle committed to Florida State. When Seminoles offensive coordinator Walt Bell left to become the head coach at Massachusetts, Howell began re-examining his options. Brown and Brewster pounced, but Howell wouldn’t commit without knowing who would call the offense. When Longo was hired, Howell jumped aboard. He’ll compete throughout the offseason against redshirt freshmen Cade Fortin and Jace Ruder. Fortin and Ruder aren’t supposed to both be redshirt freshmen, but that fact highlights just how rotten UNC’s luck was last year. Fortin started for the first time against Virginia Tech on Oct. 13 but suffered a leg injury that kept him out until the season finale against NC State. Ruder hurt his shoulder against Georgia Tech—the only game he’d played in to that point. Brown knows what he wants, but he also knows his reputation among those who haven’t worked for him. “People don’t think I coach,” he says as he begins the walk from his office to the indoor facility for practice. While it’s true that Brown isn’t as hands-on during practice and meetings as other head coaches, he also isn’t standing in a tower. In the mornings, he moves from meeting to meeting watching his assistants install North Carolina’s new schemes. While visiting Lonnie Galloway’s receiver room, Brown notices that the sideline hand signals for two different concepts look too much alike. He whips out his phone and fires a text message to himself. After lunch, Brown goes through more than a dozen text messages and creates an agenda for the afternoon staff meeting. Every issue he noticed during the day will be addressed in the Tar Heels’ war room near Brown’s office. He does it this way for several reasons. First, he doesn’t want to show up his assistants in front of the players. He wants the assistants to be the authority in the meeting room and on the field. Second, he wants everyone to know when changes get made. For instance, he knows Longo would want input on the hand signals so that everyone on the offensive staff stays on the same page. But since they can’t go play for the Bahamas Iguanas, most of the Tar Heels probably will stick around to see how Mack Brown Version 2.0 turns out.